Paint. And Lots Of It. For the past 5 weekends I've worn the same outfit. I should have taken a before and after photo of my paint splattered outfit. I'm happy to report that the inside is fully painted and looks great! I haven't gotten any good photos of the painted walls yet but I assure you - they look beautiful and I'm so grateful for the help!! My method is to take many, many samples of many, many colors and slowly delete. I camped out in the parking lot for awhile looking at many, many swatches in natural light. Decisions are made. In the end i used my favorite card stocks to help me decide. The walls painted "sour dough" matches my favorite recycled paper. The "pink chablis" in the bathroom matches my favorite Crane paper. Many thanks to our good guy "Tommy Walk-Off" for his generous help. I sort of forced this photo. For some reason Adam looks really, really much happier than either Tom or I. My wonderful sister-in-law Stacy (who is a seasoned painter) and her beautiful daughter Ashley tackled the bathroom. 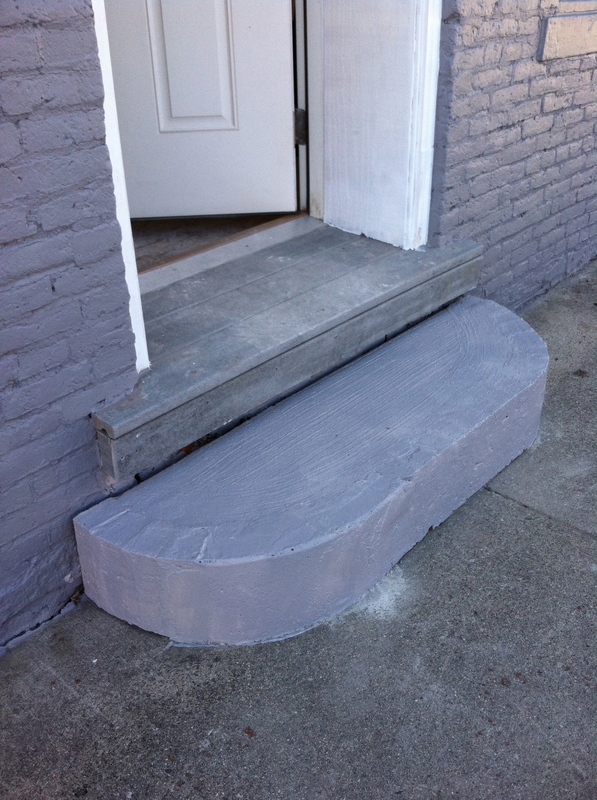 Initially we were going to replace this stoop. However, I liked the shape of it. It's a great size and I liked the rounded corners. But the crumbling brick had to go. Dad said he'd work on it and see what he could do. I had no idea things like this could be fixed. Repaired, repainted and just as good as a new one. I think this is still just the primer. The finished color matches the building nicely. Next will be pretty paint for the front door. A sign and some fall mums to dress up the place.